Get to know the “birthplace of jazz” during your extended stay in the heart of the French Quartre in New Orleans. Discover its unique flavours during a cooking class featuring the popular dishes of the city, as well as dinner at a French-Creole restaurant. 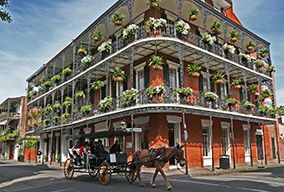 Learn the secrets of the city’s famous French Quarter on a walking tour featuring St. Louis Cathedral and the French Marketplace, and your choice of either the Cabildo or Presbytere museums. Head out to the swamp to enjoy a cruise tour of the bayous to learn about the history and ecology of this fascinating ecosystem. 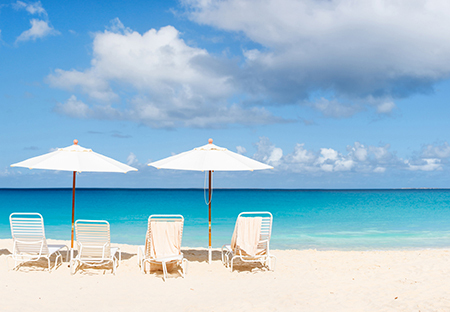 Spend time at either the poignant National World War II Museum or the festive Mardi Gras World. Come to know the city’s music when taking in a spirited jazz revue at a French Quartre Jazz Club. You will be taken on a delightful discovery through the sights, sounds and tastes of the eclectic city of New Orleans. Step into a cultural melting pot in the “Jazz Capital of the World” – New Orleans! This soulful city abounds with rich history, mouth-watering Cajun and Creole cuisine, and an incomparable soundtrack. Get to know the city’s famous French Quartre on a walking tour featuring the majestic St. Louis Cathedral, one of the city’s most recognizable landmarks. Continue on to the bustling French Marketplace where you’ll explore Pirates Alley and the Pontalba. Then the choice is yours! Perhaps you’ll enjoy exploring the Cabildo, a Spanish Colonial building that houses the Louisiana State Museum and extensive exhibits on the Battle of New Orleans. Or, you may choose to spend time at the Presbytere strolling through exhibits that feature the history of Mardi Gras and Louisiana hurricanes including Katrina. Next, stop to taste a true New Orleans favourite – beignets at Café Du Monde. Tonight, roll up your sleeves and prepare to discover how to cook New Orleans-style! During a unique cooking demonstration at the New Orleans School of Cooking, your chef will indulge you in everything that Louisiana cuisine has to offer. Following dinner, discover why New Orleans is known as the “Birthplace of Jazz” when you take in a spirited jazz revue at a local French Quartre jazz club. Set out on a drive along New Orleans’ historic Esplanade Avenue. Then, journey through Louisiana’s swamp on a cruise* narrated by your captain. Learn about the history and ecology of this fascinating ecosystem while keeping an eye out for wildlife including bald eagles, herons, turtles and alligators! Return to New Orleans and spend the remainder of the day at leisure to discover this great city your way. This morning, enjoy a panoramic tour of New Orleans with a local guide. Begin by seeing St. Louis Cemetrey #3 which opened in 1854 and holds some of the most elabourate crypts found in the city’s cemetreies. Then, relax during a drive along the shoreline of Lake Pontchartrain. This romantic road eventually leads to St. Charles Avenue, whisking you past gorgeous mansions as well as Tulane and Loyola, two world-famous universities. This afternoon, the choice is once again yours! Take a walk through history at the National World War II Museum to learn about the American experience in the war. Or, you may prefer to celebrate the festive side of New Orleans at Mardi Gras World; come to know the history of this unique tradition and tour a working warehouse where artisans create spectacular floats for the famous parades. Tonight, enjoy a taste of New Orleans during dinner at one of the French-Creole restaurants the city is known for. Your tour of this captivating city comes to a close today. Take in a spirited jazz revue at a local French Quarter jazz club. Journey through Louisiana’s swamp country on a narrated cruise. Enjoy a panoramic tour of New Orleans featuring St. Louis Cemetrey, opened in 1853. Explore one of two branches of the Louisiana State Museum. Stroll the Cabildo, a Spanish Colonial building that is home to many rare artifacts or visit the Presbytere which focuses on the history of Mardi Gras and more. Indulge in a taste of a New Orleans favourite — beignets at Café Du Monde. Tour not recommended for children under 10 years of age. Walking tour conducted on uneven sidewalks and streets, so please wear comfortable shoes! Casual, comfortable attire recommended; however, please avoid tank tops, cut-offs and very short shorts for the dining experience. Spend an afternoon immersed in the traditional side of New Orleans. Savour lunch featuring Creole cuisine at a charming French Quartre waterfront restaurant. Then embark on a leisurely cruise aboard the traditional Steamboat Natchez, iconic in New Orleans. The ambience will transport you back in time to the 19th century when steamboats were the mode of transportation of choice to travel along the Mississippi. Sit back and take in your surroundings during your narrated harbour tour, listening to stories of days gone by along the way. As your paddlewheel boat makes its way back, it is time for a lively jazz band to take the stage for some toe-tapping fun!